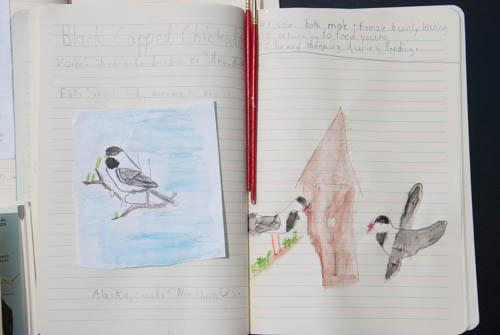 Do you do any nature journalling or notebooks with your children? If not, this a great time of year to start! We’ve been enjoying learning all about our local wildflowers as they are appearing both in our backyard an along our hiking trails. We are also amazed at the opportunities for birdwatching close to home, even in our own backyard! The most notable bird we have seen this year was back in February when we spotted a snowy owl; what a truly amazing sight that was! Nature study is a really great way to keep your learning going during the summer break; it’s fun, gets you into the great outdoors, builds curiosity, and can encompass many different aspects of learning that you might not have though of. Did you ever consider that nature study could encompass physical exercise, science, language arts, and art? Here’s how! Physical Exercise – take the kids on a nature hike! You can vary the level of physical activity depending on your own fitness goals and the age of your children. Some trails can be quite challenging or long, so pack a snack, put on your sunscreen and head off on an adventure! Science – This one is the most obvious. Nature study ties in especially nicely with biology lessons, but you could also have some fun with earth sciences. Observe the life cycles of birds, insects, etc. Discuss the parts of a plant, invasive species, land formations, and weather. Language Arts – Really? Yes, really! Nature journals provide opportunity for your children to practice penmanship, copy beautiful poetry verses about nature, or compose their own thoughts. A great read aloud to accompany your nature studies would be The Burgess Bird Book For Children. 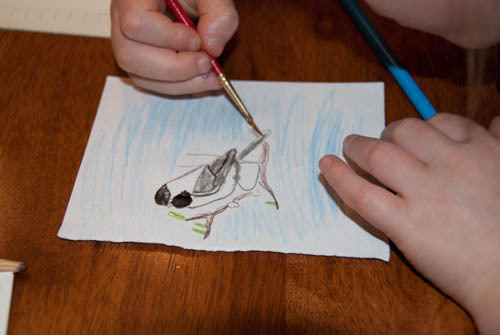 Art – Sketching what they observe is a great way for children (and parents!) to practice their drawing skills. Explore art further with watercolours or chalk pastels! Allow nature to inspire you! 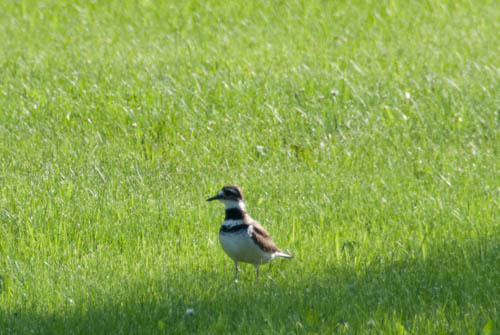 Just this past week we were visited by this lovely killdeer mama and two little chicks, not yet able to fly! 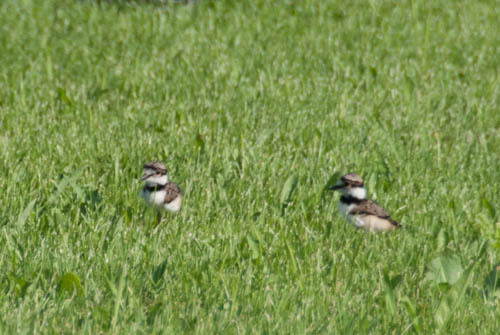 We were amazed to learn that killdeer eggs take extra long to hatch, and emerge from their shells with their eyes open, ready to run about looking for food! 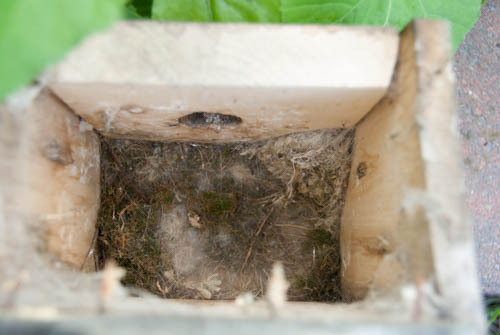 Back in May, we noticed that two black-capped chickadees were busy coming in and out of a birdhouse on the back of our garage. We watched them for about a month when we began to hear a chorus of cheeping greeting their return after each trip! Such a lovely sound! The chickadees were quite friendly with us, and not at all fearful. They actually had a habit of landing on the line beside me while I was pinning the wash out to dry! Well, one day a week or so ago, the chickadees came no more. I was so disappointed that we missed their exit from the little wood box that had been their home! We’ve been busy adding our observations to our notebooks. We drew/traced them with watercolour pencils and then went over them with a wet brush which produced a lovely effect. We also used the Chickadee Chalk Art Tutorial from Hodgepodge to make some beautiful pictures. Just yesterday we pulled the house down off of the wall and opened it up to see what they may have left behind. We were wondering if it would be full of egg shells and bird droppings, but all we could see was some white fluff and moss. If you haven’t tried nature study yet with your kids, why not give it a try this summer? It’s a great way to keep little minds and bodies active during the summer break, or all year through! This post is linked up at Charlotte Mason Moments, Trivium Tuesdays, Hip Homeschool Hop! and at Weekly Wrap Up. Good job on the journals! Thanks for the link to the chalk art tutorial. My daughter has done some chalk art and will be keen to try this out. Thanks. Thank you for joining up on the Charlotte Mason Moments link up. I very much enjoyed this post. We LOVE chickadees – there are tons of them in the trails by my house and we often go with handfuls of bird seed to feed them. I liked the chalk drawing link that you shared too – I’ll have to give it a try with my kids! Thanks for stopping by Tamara! We’ve really been enjoying the chalk art tutorials from Hodgepodge, I think there are over 50!